Nice! Came out really slick. "I'm high all right, but on the real thing....powerful gasoline and a clean windshield..."
Au Contraire mon ami, no moron are thee. There's a couple early alternators on eBay right now if anyone is looking. I made some mistake and don't know how to fix. Starting the engine is working fine, but the alternator circuit has an issue. The warning light goes on immediately and the control unit is on as well and gets hot. WITHOUT a running engine…..
Are this parts not working together or did I misunderstand the different drawings I used from the internet? Driving hill-climbing races with your Cobra is.... HAVEN!! Now the question would be if you‘ve an Ammeter AND an Indicator light. Would it be a mix of both or something different? You should be able to complete the light circuit as shown. Since this article is about the charging system with the Ford supplied alternators for the 289 Cobras here is a photo of the correct alternator bracket casting and adjusting arm. 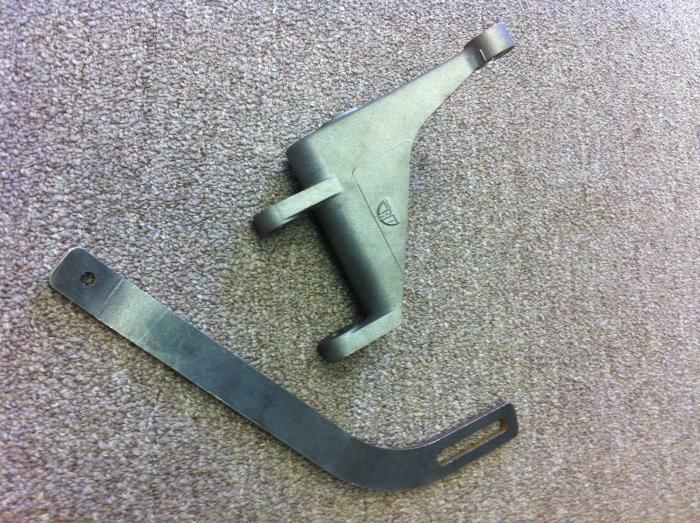 We reproduce these parts to concours standards from steel rather than the originals cast iron. It has been awhile since we last made them but with the resurgence of the 289 spec Cobras we thought now would be a good time to make them available again. I did try it and it did not work correctly. I used the drawing WITH the Ammeter (below) and integrated the Charge Indicator Light between the Ignition Switch (out) and the port I of the regulator. If I turn the ignition switch on the regulator gets activated, but no light on the Indicator Light. If I turn the ignition of the regulator remains active and the light on the Indication Light gets partial on….. The regulator only deactivates if I remove the NEG connection. What I don’t have next to my Indicator Light yet is the 15Ohm resistor. Did I something wrong with the integration of the Light? How is the drawing on the 289 street cars with Indication Light and Ammeter?? I did buy long time a go the Autolite Alternator Service Manual and it has some drawings on it. Strange is the direct connection on the Ammeter drawing between Alternator Output Terminal -> Battery + -> Regulator I. This is not on the Ford drawings...?? Been through all this myself as I used to have an Autolite alternator with a Autolite regulator on my car. I've now fitted a Lucas Dynamo (with alternator hidden inside), to get back the proper cable tacho drive to mechanical tach... but I've attached my wiring diagram which took ages to work out for an electrics-hater like me. This is Lucas wiring and colours, but it should tell you enough about what you need to work. Obviously, the car has ammeter and ignition warning light. Hope it helps! I should mention - I've driven 3,000 miles with it as the diagram with no issues. 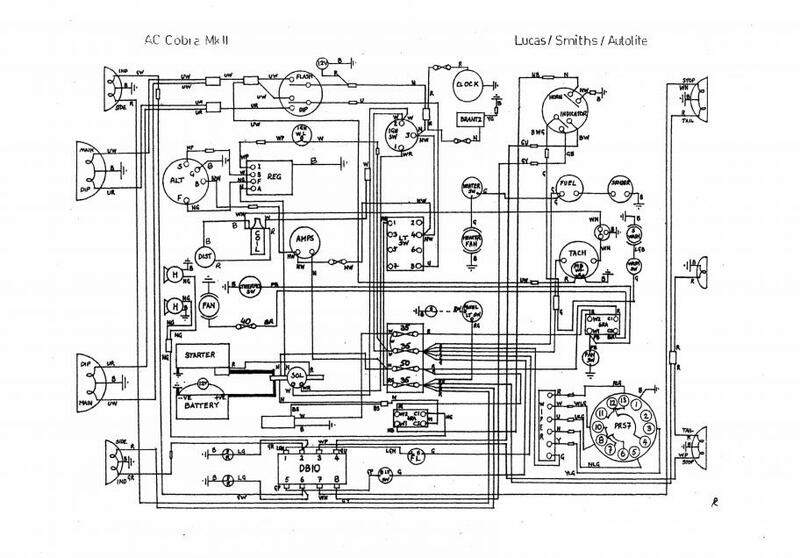 I'm using a similar Wiring Diagram on my 289 (AC Cobra Wiring Diagram Lucas Model SF4 Type Neg) with some enhancements. I’ll change my setup based on your drawing as soon I get the 15 Ohm resistance delivered to add it to the Indication Light . You're welcome. No resistor for the warning light on UK cars, though... although the one difference I've found is that the UK cars used a ballast resistor, I didn't as I am using a Pertronix III hidden inside a dual-point Hipo distributor. The Pertronix and matching coil (painted yellow and black) require full 12V all the time. You need to ad the resistor to the circuit to have the system work correctly. Since you do not have the resistor, leave that part of the circuit out and see if the charging system works correctly for the amp gauge circuit only. If that works correctly then ad the indicator light part of the circuit. Not an issue with the resistor. I should have it today or tomorrow. Good point John. I'll test it without lamp (disconnecting it to insert the resistor) and if OK I'll add the lamp incl. resistor as per the Autolite design on my post #72 and we'll see. What does the resistor do? The Ford diagrams may be somewhat different from the original Cobra diagram - I built my wiring around both the 'MkII' AC chassis manual wiring diagram and the '427/MkIII' AC diagram. Neither has a resistor shown, but my circuit connects the stator terminal on the alt to the 'S' terminal on the regulator, rather than direct to the warning light. The 'MkIII' diagram from AC is confusing in that the third connection to the regulator is unlabelled, merely showing 'W' for a white cable. Oh, and don't forget to ground both alternator and regulator cases. However as stated my car has run with Autolite alternator and regulator exactly as in my own diagram without any problems for some years now. The resistor is a back up in case the charging indicator bulb fails, this allows the charging system to continue to operate normally. If the resistor is not in the circuit and the charging indicator bulb fails your charging system will not operate. Since the bulb does not illuminate in this situation you may or may not realize that the fault with the system is the bulb and not another component in the charging system. 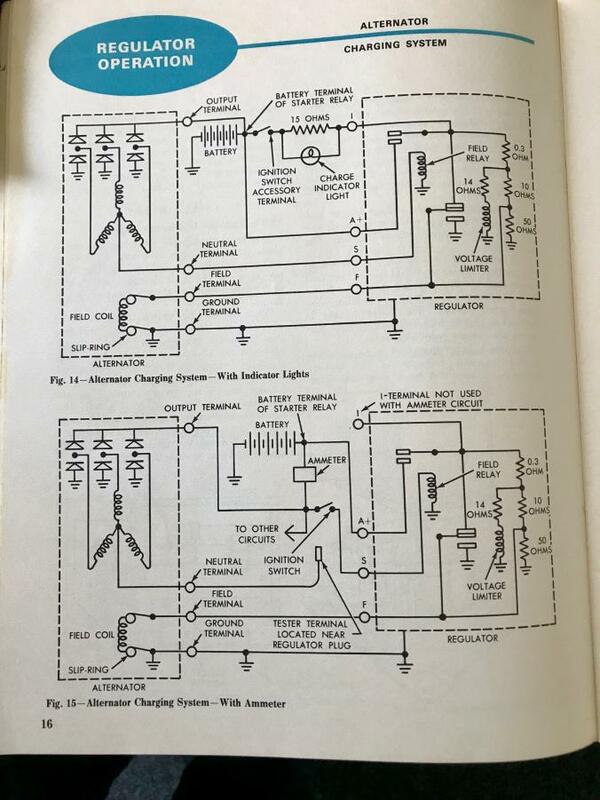 The diagram that I posted is directly from the 1964 Ford training manual for the Ford charging system with an alternator and with or without the amp meter. This manual is applicable to the 289 Cobras equipped with the Ford, wiring harness, alternator, regulator and Stewart Warner gauges. Last edited by CompClassics; 08-10-2018 at 01:48 AM..
Did you recognize the difference at the Ammeter drawing between the drawing out of the Ford Manual and the other from the Autolite Manual? On the Autolite is a connection between Alternator-O, Battery-+ and Regulator-I. The rest seems to be identical and it seems to me the source for this drawings was the same.